Walking down the streets of Amsterdam on any single day and you’ll notice the Dutch love food. Colourful signs advertising poffertjes (baby pancakes) and stroopwaffles, blinking neon signs for french fries served in a paper cone smothered in mayonnaise, and Cheese shops populate every inch of the city. With this sample on display, no wonder most vegans think that Amsterdam (and in fact most of the country) has an abysmal vegan scene. But this is not necessarily true. Yes, the Dutch like their cheese in copious amounts, but Amsterdam always has something for everyone. With a vegan wave that is taking major cities by storm, the Dutch capital hasn’t escaped, and more and more plant-based eateries are popping up around town. Read on to find out where to go for delicious vegan food if you are in town. Soep en Zo is the place where soup lover’s go to get their fix. The menu, which rotates on a daily basis, has at least eight different soups made with fresh and organic ingredients. While they serve meat, there’s always vegetarians and vegan options for those who prefer their meal animal free. Soups come with chunky slices of whole-grain bread and salads are also on offer. 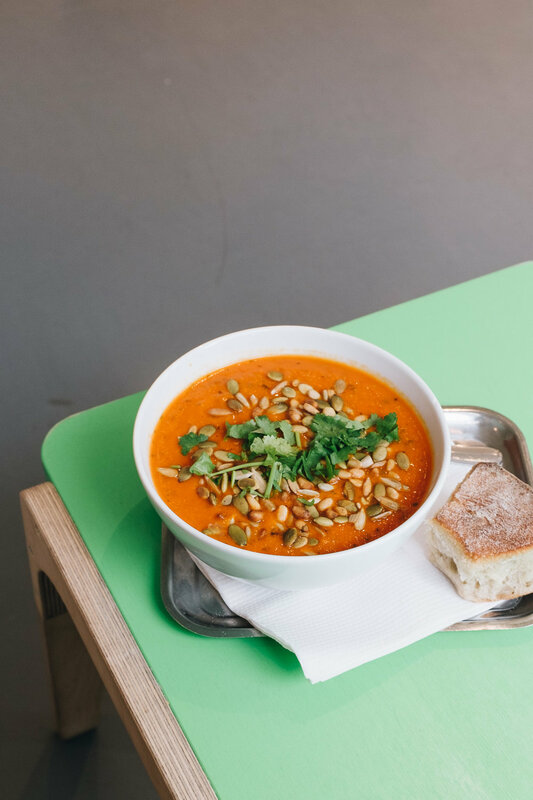 With three locations throughout the city, Soup en Zo is an excellent place for a hearty, flavoursome and healthy meal to get you through a day of experiencing the city. All hail the soup gods! With a small sitting area overlooking the canal, Vegabond is not only a place to stock up on vegan and organic products but a cafe offering sandwiches, wraps, cakes, coffee, and raw chocolate. It’s a favourite place, due to its proximity to the busy Prinsengracht, Anne Frank House and Westerkerk, so savoury food tends to go quickly. Don’t pass on the raw sweets or one of their moreish cinnamon rolls. While the concept of a mix and match salad bar isn’t anything new in these days of conscious healthy eating, SLA — appropriately, lettuce in Dutch — offers not only a fulfilling meal but one at a very affordable price. My scepticism when it comes to vegan salads is high, as nothing beats the ones you can quickly throw together at home, but SLA managed to surprise me. On offer are organic and fresh veggies, quinoa, lentils, tempeh and delicious falafel, freshly made every day. Furthermore, their salad dressings are all vegan. Funnily enough, the decor is reminiscent of a garden shed; recycled wooden furniture softens the steel and concrete, the walls covered in Winkelman's tiles and the space sprinkled with an abundance of greenery. It feels good to linger at SLA, something that’s not always true at slow-fast food places. Pluk is Amsterdam’s brunch spot by excellence, at least when one of the boxes it has to tick is to be ridiculously instagrammable. With three branches dotted around the popular 9 Straatjes, Pluk serves nutritious and colourful food. From sandwiches bursting with fresh veggies, smoothie bowls and the odd soup. They also have an appetising, hard to resist the selection of healthy cakes such as a raw carrot cake and banana bread. While this is an omni eatery, vegan options are clearly marked on the menu. But when in doubt ask the staff for details on ingredients. Pluk also makes an effort on the atmosphere and overall decor of the space. On Reestraat, the downstairs area has the counter displaying the cakes and the till, as well as a small shop selling flowers, homewares and other knick-knacks. Upstairs, is where you can sit down and enjoy your order. Venkel is yet another salad bar type restaurant serving plates full of organic veggies, fresh juices and good coffee. Just of the iconic Albert Cuypstraat, the restaurant has an airy yet rustic interior, with crates brimming with colourful fruits and vegetables. While you can choose one of the salads from their menu — vegan options marked — it is also possible to make one using whatever you fancy. Roasted pumpkin, eggplant, red quinoa, red currants or hazelnuts are some of the few ingredients to choose from. Their homemade dressing sauces are light on oil but heavy on spices and fresh herbs. Alongside freshly squeezed juices, Venkel also has homemade almond milk and vegan banana bread. The Cold Pressed Juicery is a one of a kind place in the Dutch capital. As the first cold pressed juicery and raw foods to-go bar in The Netherlands, this shop just across Anne Frank House spearheaded the raw movement in the country. Their ethos is to make healthy and nourishing food accessible to everyone and along the road they are also talking about sustainability, cutting down food waste and anything else that can improve their customers' health. The shop has an impressive menu with everything from exciting cold pressed juices like The Astronaut’s Fuel (blue majik, pineapple, raw fresh coconut water, lime), smoothies, power shots and even superfood lattes. When it comes to food, they don’t disappoint with filling smoothie bowls, raw wraps, salad jars, soups and sweet treats. One of our favourite places, don't miss it. Download Happy Cow, the veggie food app/website, listing all the veggie restaurants available near you. The Dutch word for ‘vegan’ is ‘veganist’. However, The Netherlands has one of the highest English proficiencies in the world, so it's effortless to communicate special requests to waiters.